Today is Saul's birthday! Here is the cake I made for him. 2/3 cups plus 4 tbsp confectioner's sugar, softened. See notes. 1. Set oven to 350 degrees F. Grease and flour two 8 inch cake pans. Set aside. 2. Sift together cake flour, baking powder, baking soda and salt. Set aside. 3. With an electric hand mixer, whisk together butter and ricotta cheese. Add 3/4 cup of the sugar and cream together until the mixture becomes fluffy and has lightened in color, up to three minutes. 4. Split the vanilla bean pod and carefully scrape out all the "pulp". Add vanilla "pulp", evaporated milk, and vanilla extract. Mix well. In two batches, add flour mixture, beating well between additions. 5. In a separate bowl, whisk eggs whites and cream of tartar until medium stiff peaks form. Add remaining 1/4 cup of sugar and continue to whisk until stiff peaks form. Mix in a half of eggs whites into batter, until properly incorporated. Gently fold in the remaining half. 6. Divide the mixture into two 8" cake pans, previously greased and floured. Bake at 350 degrees F for 20 minutes or until a toothpick inserted in the center comes out clean. Carefully remove the cakes from pans and cool completely on wire racks. 7. 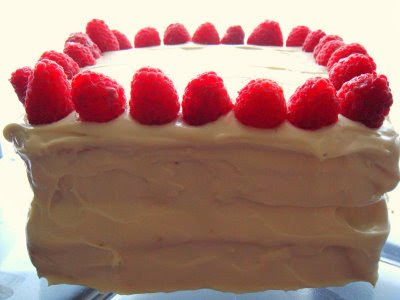 To assemble: Place one cake round on a cake dish or cake stand. Spread filling mixture evenly on top, being careful not to spill down the sides. Place the second cake round on top of the filling. Cover with frosting. 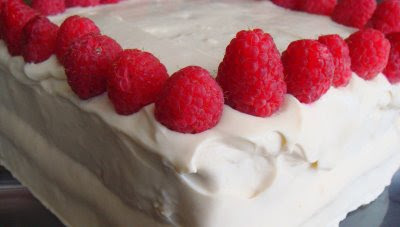 Garnish with reserved raspberries. Whisk together sour cream and sugar. Gently fold in whole raspberries. Whisk together all ingredients until light and fluffy. 1. To sweeten the frosting, you can use up to 1 cup of confectioner's sugar. I achieved the right level of sweetness with a little less. 2. You can also shape the cakes into squares the way I did here. 3. I tend to use dark brown sugar in most of my recipes because I find it enhances both the flavor and color. However, light brown sugar or granulated sugar can be substituted. 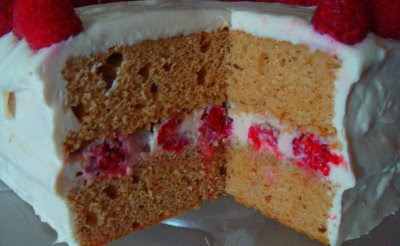 Love your cake recipe..It looks very delicious..